You will probably agree that this story does not have breathless adventure and exciting action. Then what in your opinion makes it interesting? The story ‘The Summer of the Beautiful White Horse’ is a tale told from the viewpoint of a nine-year old boy. At that age, imagination is rich and one can romanticise even insignificant actions. To such a person the world is full of excellence and glory and life is delightful and a mysterious dream. For the young poor boy, a ride on a beautiful white horse is a dream fulfilled. He had been always longing to ride and his cherished dream is realised when his cousin Mourad offers him a chance to ride on horseback—first with him and then alone. Riding the stolen horse and hiding it safely are great feats of adventure for the two boys. Though the story line is thin, we eagerly follow the course of action taken by the boys till they return the horse to its rightful owner. The story provides us a peep into child psychology. For boys who are crazy about horses, stealing a horse for a ride is not stealing. Though they enjoy the thrill of riding, they are conscious of their family pride. The Garoghlanian family is well-known for honesty and trust. They would neither steal nor take advantage of anybody in the world. Another point of interest is characterization. The delineation of the common traits of uncle Khosrove and cousin Mourad is superb. The story also contains many purple passages full of pictorial description. All these heighten its appeal to the reader. Did the boys return the horse because they were conscience-stricken or because they were afraid? The story gives no indication that the boys were afraid of anyone or anything. Hence the return of the horse was not directed by fear. Secondly, they were not at all conscience-stricken. They did not feel any pangs of repentance or remorse at their action of stealing a horse solely for the purpose of riding it. The narrator makes it amply clear when he asserts that stealing a horse for a ride was not the same thing as stealing something else, such as money. For him, it wasn’t stealing at all as he and Mourad were so crazy about horses. In his opinion, it would become stealing only when they offered to sell the horse, which he knew they would never do. The last phrase gives a clue to their mental make up. Mourad had the horse for over a month when farmer John Byro visited the narrator’s house. They retained it for two weeks more. Mourad outrightly rejected the narrator’s suggestion of keeping the horse any longer. It was his family pride that would not let him steal. He decided that the horse must go back to its true owner. The meeting with John Byro proved conclusive. He praised their family for its honesty. He trusted the boys as he knew their parents. Hence in order to uphold the family tradition and reputation, the boys returned the horse to its rightful owner. “One day back there in the good old days when I was nine and the world was full of every imaginable kind of magnificence, and life was still a delightful and mysterious dream……..”. The story begins in a mood of nostalgia. Can you narrate some incident from your childhood that might make an interesting story? I had just completed my primary education when I visited my uncle. He was a forest ranger in Dehradun. In those days there was a thick forest in the vicinity of the city and all sorts of wild animals prowled there. Uncle had advised us not to enter the deep forest, but forbidden fruit is sweet; My cousin Varun, a couple of his friends and I decided to explore the southern range. We had the kits of scouts and were fully prepared. In our boyish enthusiasm, we went deep into the jungle and reached a gorge. We were amazed to see a lioness with her cubs. One of us, perhaps, Mohit clicked his camera. The flashlight scared the lioness and she roared and leaped. Fortunately there was a big ditch and she fell into it. Meanwhile, we lit our torches, collected dry leaves and twigs and set them on fire. Momentarily, we got respite from our attackers. Then we threw some green leaves on fire to give smoke signal. A patrol party noticed it and rescued us. I shudder whenever I think of this adventure when we were close to death. The story revolves around characters who belong to tribe in Armenia. Mourad and Aram are members of the Garoghlanian family. Now locate Armenia and Assyria on the atlas and prepare a write-up on the Garoghlanian tribes. You may write about people, their names, traits, geographical and economic features as suggested in the story. The Garoghlanian family was an Armenian tribe. Eleven centuries ago it was the wealthiest family in that part of the world. However, now every branch of the Garoghlanian tribe was living in the most amazing and comical poverty in the world. These poor people had no money. Nobody could understand where they ever got money enough to keep them with food in their bellies. The Garoghlanian tribes were famous for their honesty. It had been the hallmark of the tribe for many centuries. They were proud of their family. Honesty came next and then they believed in right and wrong. None of them would take advantage of anybody in the world. No member of the Garoghlanian family could be a thief. The elders felt pained to remember that they had lost their homeland. These people shifted their residence from one place to the other. The narrator says, “That year we lived at the edge of the town, on Walnut Avenue.” They loved countryside having vineyards, orchards, olives and Walnuts. The names of the people are semi- Arabic: Mourad, Aram, Khosrove etc. “I couldn’t believe what I saw,” says the narrator. What was so unbelievable? Why? The narrator saw his cousin Mourad sitting on a beautiful white horse. It was unbelievable, for they belonged to poor families and buying such a beautiful horse was beyond their means. What two character-traits of Mourad are hinted at by the narrator in the initial part of the story? Mourad was considered crazy by everybody who knew him except the narrator. He was quite crazy about horses. Secondly, he enjoyed being alive more than anybody else. “This was the part that wouldn’t permit me to believe what I saw.” What ‘part’ does the narrator hint at? The narrator refers to their poverty. They had no money. They lived in extreme poverty and it was difficult to understand how they got food to satisfy their hunger. He frankly admits that every branch of the Garoghlanian family was living in the most amazing and comical poverty in the world. What traits of the Garoghlanian family are highlighted in this story? The Garoghlanian family though now poor, were famous for their honesty even when they were wealthy. They were proud of their family first, honest next and after that they believed in right and wrong. None of them would take advantage of anybody in the world. They would not steal. No member of the Garoghlanian family could be a thief. How did the narrator react on seeing the horse and Mourad? The horse was magnificent to look at, gave out a lovely smell and its breathing was quite exciting. Yet he couldn’t believe that the horse had anything to do with Mourad, because he couldn’t have bought it. What conflicting thoughts passed through the narrator’s mind on seeing Mourad on a beautiful white horse early one morning? The narrator was surprised. He knew that his cousin Mourad couldn’t have bought the horse. Since he couldn’t have bought it, he must have stolen it. However, family pride came in the way. He refused to believe that he had stolen it. What feelings did the sight of cousin Mourad and the horse arouse in the narrator? The narrator stared first at his cousin and then at the horse. There was a pious stillness and humour in each of them. He was delighted as well as frightened. “It was true, then. He had stolen the horse. There was no question about it. He had come to invite me to ride or not, as I chose.” How did the narrator convince himself to enjoy a horseride with cousin Mourad? It seemed to him that stealing a horse for a ride was not the same thing as stealing something else, such as money. Since he and Mourad were quite crazy about horses, it wasn’t stealing. He convinced himself with the thought that it would become stealing only when they offered to sell it. Give examples to show why cousin Mourad was considered one of the craziest members of the narrator’s family? Cousin Mourad had a crazy streak. He was quite crazy about horses. He kept the stolen white horse for about six weeks, rode it, loved it, fed it well and hid it in a deserted yard. When he sang in the open countryside, it seemed as if he were roaring. Why does the narrator mention uncle Khosrove? Which characteristic features of the man are highlighted? Cousin Mourad seemed to inherit the crazy streak of uncle Khosrove. He was a big man with a powerful head of black hair and very large moustache. He was quite furious in temper, very irritable and impatient. He would stop anyone from taking by roaring his pet phrase, “It is no harm; pay no attention to it”. Give an example to illustrate how uncle Khosrove’s impatience sometimes worked to his own disadvantage? Once uncle Khosrove was getting his moustache trimmed in a barber’s shop. Suddenly their house was on fire. His own son Arak ran eight blocks to the barber’s shop to inform him. Khosrove got impatient and roared at his son. When the barber reminded him that his house was on fire, Khosrove roared at him and stopped him from talking. “The distribution of the various kinds of spirit of our tribe had been from the beginning capricious and vagrant.” Elucidate. The Garoghlanian family had a crazy streak. Mourad was considered the natural descendant of uncle Khosrove as far as the crazy streak was concerned. Mourad’s father, Zorab was practical and nothing else. But Mourad was his son only in flesh; in spirit, he was similar to uncle Khosrove. Give a brief account of Mourad’s joy ride. Mourad kicked his heels into the horse and shouted, “Vazire run!” The horse stood on its hind legs, snorted, and ran forward at full speed. Mourad raced the horse across a field of dry grass to an irrigation ditch. He crossed the ditch on the horse. When he returned five minutes later he was dripping wet. How did Aram, the narrator, fare in his solo ride? Aram leaped to the back of the horse, but it did not move. Then he kicked into the muscles of the horse. It reared and snorted. Then it began to run. Aram did not know how to ride. The horse ran down the road to a vineyard. It leaped over seven vines, threw the rider and ran away. “We’ll either take him back or hide him until tomorrow morning”. Which course of action did the speaker take and why? Mourad took the latter option. He hid the horse in the bam of a deserted vineyard which at one time had been the pride of farmer named Fetvajian. There were some oats and dry alfalfa in the bam. So Mourad did not seem worried about the horse. How do you think, had Mourad developed an understanding with the horse and what was the result? Mourad had been quite tender and affectionate towards the horse. He would put his arms around it, press his nose into the horse’s nose and pat it. It was not easy to tame someone else’s horse and get it to behave nicely. At first, it wanted to run wild. Gradually, Mourad was able to control the horse and do what he wanted. Even John Byro, the rightful owner, admitted that the horse had become better-tempered and stronger than ever. Contrast the two visitors to narrator’s house who visited them one afternoon. Uncle Khosrove was irritable, impatient and furious in temper. He stopped anyone from talking by roaring: “It’s no harm; pay no attention to it”. Farmer John Byro was a lonely Assyrian. He was sad at the loss of his horse and the uselessness of his surrey without a horse. How did uncle Khosrove react to John Byro’s complaint about the steal of his horse? What arguments did farmer John Byro advance to prove the usefulness of a horse to a country dweller? First, his surrey was no good without a horse. Second, he had to walk ten miles to get there and his left leg pained him. Thirdly, that horse had cost him sixty dollars. A city dweller like Khosrove may not realise the importance of a horse. Why did farmer John Byro stalk out of the house, slamming the screen door? Farmer John Byro visited the narrator’s house. He was homesick, sad and lonely. His horse had been stolen for over a month. Instead of showing any sympathy or concern for his loss, uncle Khosrove repeated his catchword: “It’s no harm. Pay no attention to it”. When John Byro talked about the cost of horse, uncle Khosrove commented: “I spit on money.” This was too much for John Byro to bear and so he left the house in disgust. How did Mourad help the wounded Robin to fly? What does this incident indicate? Answer: The narrator noticed Mourad trying to cure the hint wing of a young robin which could not fly. He was talking to the bird. After sometime, he threw the bird into the air. The bird tried hard and almost fell twice. However, at last it flew away, high and straight. This incident shows that in spite of having a crazy streak, Mourad was kind at heart and gentle towards God’s creatures. What request did the narrator make to his cousin Mourad about the horse? How did he react to it? What does this reveal? The narrator requested his cousin Mourad not to return the horse to farmer John Byro till he learnt to ride. Mourad observed that it might take him a year. The narrator suggested to keep the horse for a year. Mourad shouted that he was inciting him to steal. He declared that the horse must go back to its true owner. This shows his honesty and sense of family pride. What did farmer John Byro observe after studying the horse the two boys had with them? The farmer studied the horse eagerly and asked its name. Mourad said that they called it “My Heart’. John Byro appreciated it as a lovely name for a lovely horse. He was ready to swear that it was the horse that was stolen hum him many weeks ago. “A suspicious man would believe his eyes instead of his heart.” In what context was this observation made and by whom? This observation was made by farmer John Byro after looking into the mouth of the horse. It matched his horse tooth for tooth. He would have claimed it as his own horse if he had not known their parents or the fame of their family for honesty. The resemblance was so striking that he called it the twin of his horse. What do you think, induced the boys to return the horse to its owner? The boys were impressed by John Byro’s attitude towards their parents and family. He knew their parents very well and so believed whatever the boys said. Secondly, the fame of their family for honesty was well-known to him. The boys returned the horse to him for the sake of family pride and dignity. 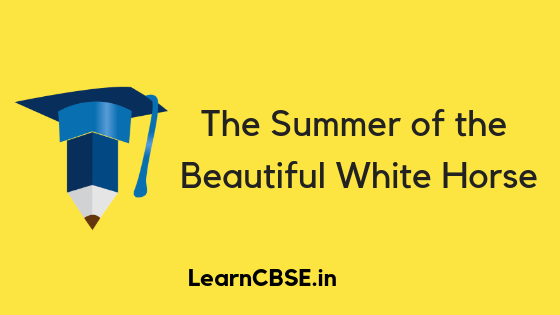 Narrate the story ‘The Summer of the Beautiful White Horse’ in your own words. One summer morning narrator’s cousin Mourad came to his house at four in the morning and woke him up by tapping on the window of his room. The narrator was surprised to see Mourad sitting on a beautiful white horse. Mourad asked him to be quick if he wanted to ride. The narrator, Aram, longed to ride and jumped down to the yard from the window and leaped up onto the horse behind his cousin Mourad. Since these Armenian families were quite poor, Aram concluded that Mourad must have stolen the horse. They rode and Mourad sang. Then Mourad had a joy ride alone. It seamed he had a way with a horse, for when Aram tried to ride alone, the horse threw him off and ran away. Since it was broad daylight, Mourad hid the horse in the ham of a deserted vineyard. That afternoon, farmer John Byro visited the narrator’s house and related his plight. His white horse had been missing for over a month. Uncle Khosrove silenced him with his roaring commands. Aram reported everything to Mourad and requested him to keep the horse till he learnt to ride. Mourad did not agree. A chance meeting with farmer John Byro after a fortnight firmed up his decision. John Byro had believed the boys since he knew their fathers and was fully aware of the fame of their family for honesty. Mourad returned the horse to its owner then next morning. Relate some of the humorous incidents in the story. Which incident do you find the most amusing and why? When the barber explained that his son was saying that his house was on fire, Khosrove silenced him by roaring: “It is no harm”. At the end of the story, uncle Khosrove again became irritated and shouted at farmer John Byro to be quiet. He said, “Your horse has been returned. Pay no attention to it.” The incongruity is obvious. The most amusing incident is the conversation between farmer John Byro and uncle Khosrove when the farmer sighed sadly and bewailed the stealth of his horse. Uncle Khosrove remarked, “It is no harm. What is the loss of a horse? What is this crying over a horse?” John Byro tried to explain that his surrey was useless without a horse. Pat came Khosrove’s catchward “Pay no attention to it.” This phrase is repeated when the farmer complained that his left leg hurt him. When John Byro said that the horse had cost him sixty dollars, Khosrove remarked, “I spit on money.” The incident ends as John Byro walked out angrily slamming the screen door. What impression do you form of cousin Mourad? Mourad is a young boy of thirteen. He belongs to the Garoghlanian family of Armenia. Their whole tribe was poverty stricken. In spite of abject poverty, their family was famous for honesty. Mourad was quite adventurous and had a crazy streak in him. He enjoyed being alive more than anybody else. Mourad loved horse riding. He had a way with a horse. He had tamed the horse by his affectionate behaviour and now the horse was no longer wild. It obeyed Mourad faithfully. His love for the horse is evident in the last scene. While parting, he put his arms around the horse, pressed his nose into the horse’s nose and patted it. He also had a way with dogs. The dogs of John Byro followed them around without making a sound. He was kind. He treated a young robin which had hurt its wing. He was worldly-wise and knew how to talk to farmers. Though he loved horse-riding he was averse of keeping the horse for a long time. He is proud of his family which is well known for their honesty and trust. In short, he is a lovable chap. Comment on the role of Aram, the narrator, in the story. Aram plays an important role in the story. Besides being the narrator, he is also a commentator. He not only narrates the various adventures, incidents and actions, but also provides useful information regarding the main characters and their behaviour. In fact, he is the fulcrum on which the whole story rests. He gives a graphic description of the Garoghlanian tribe, its members, their traits and economic features. Mom-ad’s father Zorab is described as a practical person, whereas Mourad and uncle Khosrove represent the crazy streak in the tribe. Abject poverty of the family does not diminish his pride in his family which is famous for honesty. He says, “No member of the Garoghlanian family could be a thief.” He makes a fine distinction between stealing a horse for a ride and stealing a horse to sell it off. He gives a fine description of the horse ride and country side with its vineyards, orchards, irrigation ditches and country roads. Compare and contrast uncle Khosrove and cousin Mourad. Khosrove shouts at his son Arak, the barber and farmer John Byro. The narrator is a patient listener to Mourad’s assertions. The difference lies in their age groups and physical build up. Uncle Khosrove, a middle aged person is an enormous man with a powerful head of black hair and very large moustache. Mourad is an athletic young chap of thirteen. Khosrove is irritable, impatient and furious in temper. Mourad is reasonable in conversation.